I recently had someone ask me this question on Twitter and I think it’s an important question! How do you plan a succession of lessons for a maths topic, say multiplication or division? As it turns out, I’ve spent the last 4 years planning sequences of lessons as part of the curriculum work I do with a team of math specialists, so I have some significant experience with this task. The first step in our process was to decide on a logical sequence for the units of study for the year. Given the amount of time we had to devote to curriculum development six years ago, we basically decided to outsource this part of the process to the Mathematics Design Collaborative, but there are a lot of ways to decide on an order to units and to some degree, the choices are arbitrary. It’s what comes after that is critical but this allowed us to decide on an initial apportioning of the content standards to specific units. We started with assigning a formative assessment lesson from the Mathematics Assessment Project to each unit, essentially deciding on “what does it look like to be successful in the mathematics of this unit?” first before outlining the mathematics of the unit. This decision, to work backwards from the end goal, is described in more detail in Grant Wiggins and Jay McTighe’s book, Understanding by Design. 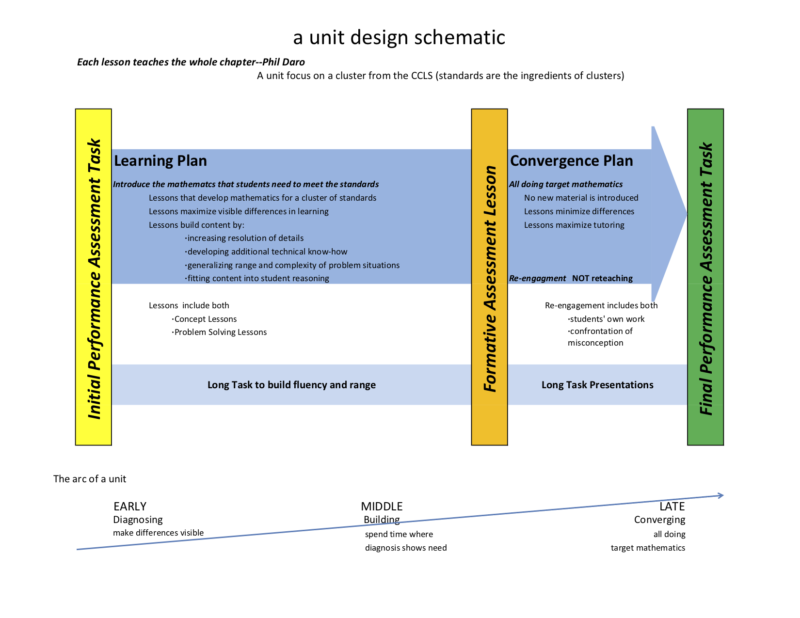 My colleague, Russell West, created this Unit Design Schematic to outline the general structure we intended to build for each unit. 6 years ago, we had a partnership with the Silicon Valley Mathematics Initiative, and they have literally hundreds of rich math assessment tasks aligned to high school mathematics. I printed out all of them for middle school and high school and we put them on a giant table in our office board room. My colleagues and I then sorted all of the tasks into the units where we felt like they fit best (or in some cases to no unit at all). Our experience suggested that tasks are a better way to define the mathematics to be learned than descriptions of mathematics. Once we had descriptions of the units, formative assessment lessons, and tasks for each unit, we decided an initial task and a final task for each unit. The goals of the initial tasks were to preview the mathematics for the unit for students and teachers and to give students and teachers a sense of what prerequisite mathematics students already knew. 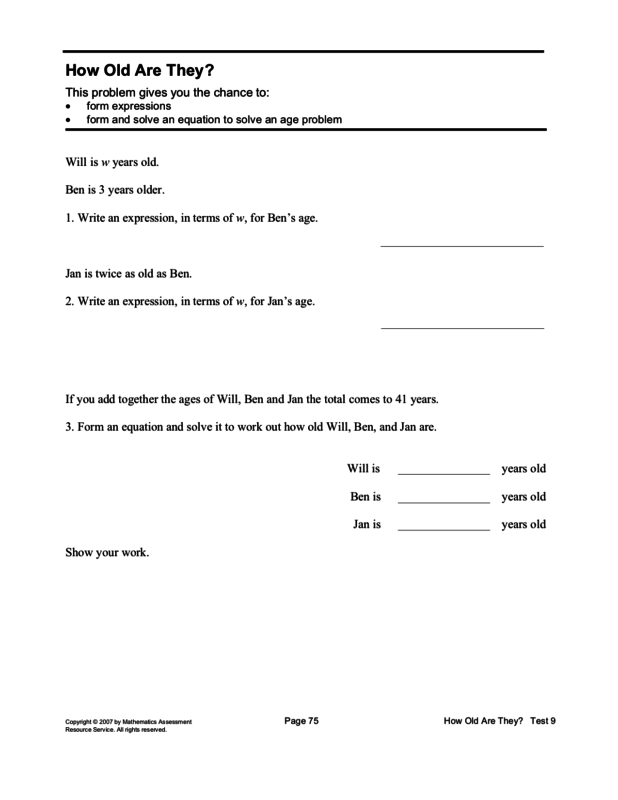 The goals of the end of unit assessments were to assess students understanding of the current unit and to give students and teachers a sense of the end of year assessments, which in our case are the New York State Regents examinations. By chance, we watched this talk by Phil Daro on teaching to chapters, not lessons, and decided that we needed to group the atomized ideas we had generated into chunks and we labeled these chunks “big ideas”. The next part of the process took a long time. We wrote descriptions of the Big Ideas and the evidence of understanding that would tell us if students understood the big idea for the week. This evidence of understanding was essentially the result of the atomizations that we had previously created, grouped together into week-long chunks. The process took a while because we wrote and rewrote the evidence of understanding statements so that our entire team and a sample of the teachers we worked with felt like we understood what the evidence of understanding meant. For example, the first Big Idea of our Algebra I course is “Rate of change describes how one quantity changes with respect to another” and our evidence of understanding, at this stage in the course, include statements like “determine and apply the rate of change from a graph, table, or sequence” and “compare linear, quadratic, and exponential functions using the rate of change”. The last Big Idea of our Algebra II course is “Statistical data from random processes can be predicted using probability calculations” and the evidence of understanding for this Big Idea includes statements like “predict the theoretical probability of an event occurring based on a sample” and “compare two data sets resulting from variation in the same set of parameters to determine if change in those parameters is statistically significant”. Once we had this evidence of understanding mapped out, we also checked to see whether important ideas would come back throughout the course in different forms and looked to make sure that deliberate connections between different mathematical representations were being made. This way students would get the opportunity to revisit ideas, make connections between topics, and have opportunities to retrieve information, frequently, from their long-term memory. We also revisited the alignment of the New York State Learning Standards to our units, and ended up adding standards to some units, moving standards around in some cases, and writing some clarifications about what part of a standard was addressed when during the course. Now, finally, we were ready to make tasks. Well, actually, in practice we started making tasks as soon as we had a sense of the Big Ideas and then occasionally moved those tasks around when we had greater clarity on the mathematics to be taught. 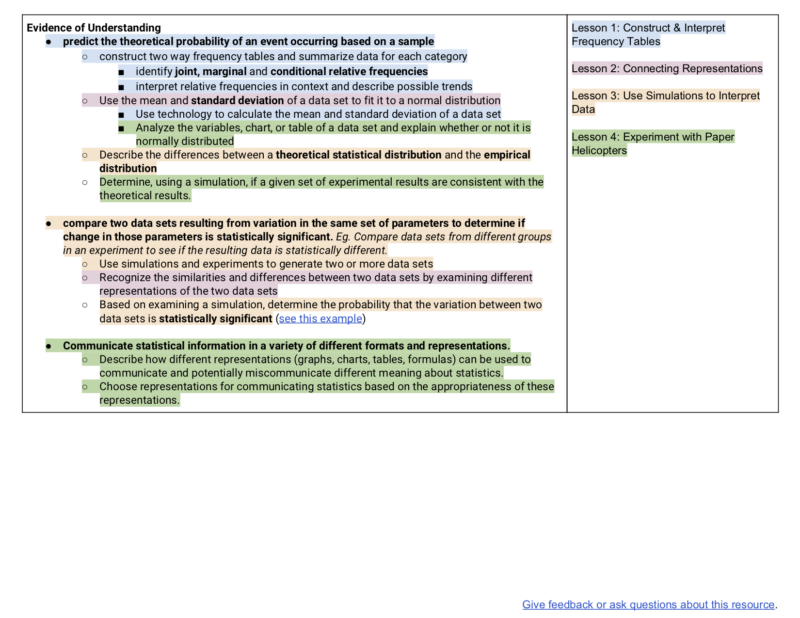 But once we had nailed down the evidence of understanding, we were able to map the evidence of understanding for a week to specific activities, essentially creating blueprints for us to design our tasks from, since each of the evidence of understanding statements were linked to observable actions of students. We ended up with a final product we called a Core Resource. It’s larger than a single lesson but it’s not just a random collection of lessons either. It’s a deliberately sequenced set of activities meant to build toward a coherent larger idea, while attending to two practical problems teachers encounter frequently – that of students forgetting ideas over time and needing a lot of time to build fluency with mathematical representations. Here is a sample Core Resource for Algebra II. and then finally design tasks that match the mathematics. For multiplication and division specifically, I would be tempted, as much as is possible, to frequently interleave the two ideas together, after identifying the many constituent mathematical ideas that together represent these large mathematical ideas. For example, if students learn to skip count by twos, five times, to find how many individual shoes are in five pairs of shoes, I would want to work backwards fairly soon from there to I have 10 pairs of shoes, how many pairs do I have, so that students can more directly see these two operations as opposites of each other. Very helpful David. Will share with my partners and see how we can improve our maths planning.